When I lie awake at night, often post ideas swim around my head, most of which are pretty good. But when I wake up the next day (or at least when I have the time to sit down and write a post), those great ideas and half-written-in-my-head posts have disappeared. So I just thought I would throw a few things out there. We must, we must, we must increase our busts! Last evening, for reasons I cannot remember, my eight-and-a-half-year-old third grader asked if she could get a bra. Well, bras. For a girl, the first bra is a big deal, and I am fairly certain that the vast majority of ladies out there remember their first (or at least early) experience with that mystical piece of fabric. 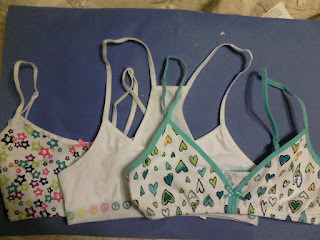 My earliest memory of bra-land was in the fourth grade. A note came home informing families that scoliosis tests were being conducted the next day. Girls were instructed to wear a bra, so they could be examined together in the same room (rather than sending them one at a time into a smaller room with the nurse). I am a wimp. A big one. Before I launch into this post, telling you how I can hardly handle pain stronger than a toe stubbing (and sometimes that is too much), let me first say that I birthed my only child without the use of any drugs. Nada. Nothing. Zilch. Everyone who knew me well was shocked I was able to do that. But do it I did. Not because I wanted to experience "natural" childbirth. No, intense contractions and the actual pushing don't seem all that natural to me. They definitely weren't beautiful, amazing, or however some crazy moms describe them. The real reason I birthed my kid without drugs? I did not want a needle in my spine. It is weird for me to blog so infrequently. Yet I almost (almost!) don't miss it. I started working at a company on part-time, freelance basis almost four weeks ago. Even though I have been working only about 20 hours per week, I have had to juggle some things, commute a few times (have not missed that), and send my kid to after-school care twice. When you throw in a day of subbing, no school for almost a week, plenty of Easter-related church, spending time with relatives, and everyday normal stuff, well, blogging and Facebook take a backseat. But I did want to get in a good "Let's go, Pens!" cheer as today is the official start of the tied-for-first-place most wonderful time of the year--the Penguins-included hockey playoffs (Steelers playoffs share the trophy, in case that was not clear).